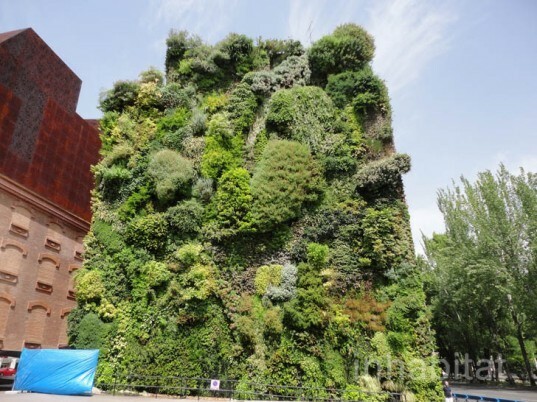 Madrid’s epic vertical garden on the front of the CaixaForum is one of the world’s most lush living walls to date. Designed by Patrick Blanc in 2008, the dramatic four-story green wall contrasts with the deep orange rust of the adjacent building, which was designed by Swiss ar­chi­tects Herzog & de Meuron. The thriving wall welcomes visitors to sit beneath it and cool off from the arid Madrid sun. In a city warmed by constant sun in the summer, locals are constantly looking for a way for temporary relief from the blistering sun. Blanc’s gorgeous green wall does just that, beckoning visitors to stop for a respite after a few hours at the Prado Museum just down the street. The wall covers the entirety of the wall located on the square in front of the rusted steel CaixaForum, a lace-like renovation of a former power house. Located in the heart of Madrid’s cultural district with museums around every corner, the vertical garden resembles a piece of environmental graffiti as much as it is a botanical piece. The pattern of colors, is a fascinating combination of art, architecture and botany. Splotches of greens, reds and yellows grow in tufts over the wall, in a mass of flowering plants, ivy and climbing shrubbery. The self-irrigating wall is kept green with drips of water that feed the plants and cast a cooling mist to visitors sitting around the reflecting pool below. Blanc’s wall has a variety of plants, instead of the usual ferns and mosses, which were carefully chosen to flourish in the hot Madrid climate. Over 250 species are represented on the living wall in a mass of over 15,000 plants for the miniature oasis. One can feel the drastic cooling effect of the wall when sitting next to it, with the temperature feeling several degrees cooler in its proximity. Blanc’s wall shows that green walls can grow in even the hottest and driest climates, and provide not just a lush landscape, but also relief from the heat. Shame about the awful cement courtyard in front of it. In a city warmed by constant sun and winds off the Sahara Desert across the Mediterranean, locals are constantly looking for a way for temporary relief from the blistering sun. Blanc’s gorgeous green wall does just that, beckoning visitors to stop for a respite after a few hours at the Prado Museum just down the street. 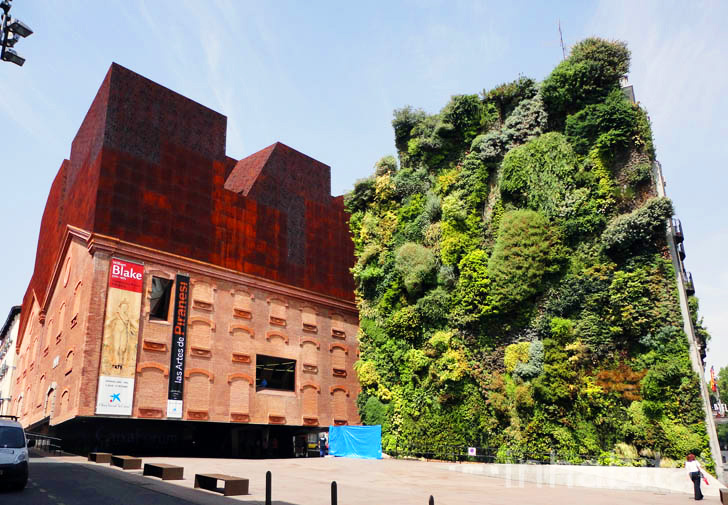 The 78 inch high green wall covers the entirety of the wall located on the square in front of the rusted steel Caixa Forum, a lace-like renovation of a former power house. Located in the heart of Madrid’s cultural district with museums around every corner, the vertical wall resembles a piece of environmental graffiti as much as it is a botanical piece. The pattern of colors, along with its movements with the wind make the wall take on an anthropomorphic sculpture feel, blending art, architecture and nature. Splotches of greens, reds and yellows grow in tufts over the wall, in a mass of flowering plants, ivy and climbing shrubbery. The self-irrigating wall is lush with drips of water that feed the plants, as well as cast a cooling mist to visitors sitting around the reflecting pool below. Blanc’s wall has a variety of plants, instead of the usual ferns and mosses, which were carefully chosen to flourish in the hot Madrid climate. Over 250 species are represented on the living wall in a mass of over 15,000 plants for the miniature oasis.